Ever since they first showed up, Kigurumi onesies have been gaining more and more popularity. It seems that most people from all around the world want to sleep in one of these. They are absolutely adorable, unique, and amazingly creative. But, a lot of different materials are in use for these onesies, and it’s important to choose the right one for you. We’re here to help you with that. You see, how comfortable a onesie will be depends directly on the material that it is made from. 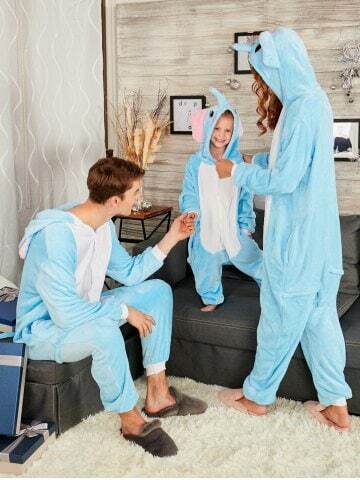 When it comes to Kigurumi, a lot of different materials are in use – traditional ones like cotton, warm ones like polar fleece, as well as modern blends. For those cold winter months, fleece is the best choice out there. One thing that makes it simply perfect is its insulating capability. In addition, fleece is also plush and light, so it is comfortable and warm. Another great thing about fleece onesies is the fact that they are rather cheap when compared to other materials. As we all know, cotton is one of the most versatile materials. That is why it is often used for onesies. It is sturdy, stretchy, breathable and airy, which is why it is ideal for Kigurumi. This organic fabric won’t harm even the most sensitive skin, so if you’re allergy-prone, bear this in mind when choosing your onesie. Another great thing about cotton is the fact that it provides the same comfort level whether it’s summer, spring, autumn or winter. Just keep in mind that 100% cotton onesies tend to cost a lot more than cotton blend ones. One of the cheapest material options is polyester, and it is often used for these soft pajamas. The good thing about polyester is that it is durable, and it lasts long. If you take a onesie made of this material, you can wash it regularly, and it will definitely not have an adverse effect on the onesie. Onesies made of satin are comfortable and gorgeous at the same time. This expensive fabric is perfect for loungewear, as well as for pajamas. Its heavy texture makes it a good choice for both winter and summer months. It is a lot pricier than other onesie fabric options, and you need to pay special attention to maintenance. Satin wrinkles a lot, so after every wash, and every wear, you’ll need to iron it if wrinkles annoy you. So, if you need a onesie for special occasions, take one made of satin. Otherwise, stick to simpler materials. Some people love the feel of flannel on their skin, so some onesies are made of this woven fabric. In most cases, this material is a combination or cotton blends and synthetic fibers. It is comfortable, however, it can be very hot to sleep in. It all depends on you, and the use you have in mind for your onesie. If you need a onesie to sleep in, cotton is great for summer months, and fleece is the best for winter ones. On the other hand, if you need a special occasion onesie – take one made of satin. If you need casual loungewear, flannel and polyester are comfy enough. Hope we helped you make a good choice!